Also available in Spanish I want you to know that it is possible today to have a marriage so good and so fulfilling that it can only be explained as a miracle. So in obedience with Titus 2, where God commands the aged women to teach the younger women, I have obeyed and given you the very best I can do — 27 chapters, 304 pages, including letters from my readers, recounting counseling sessions, wisdom gleaned from my daughters, my own very personal stories, and, of course, the Word of God. It includes subjects as varied as planning meals to answering extremely intimate questions. Created to Be His Help Meet, first published 10 years ago, has sold over 500,000 copies in 12 languages. I am amazed, reading the testimonies of woman in England, India, Saudi Arabia, China, Australia, and many other countries, as they share how their marriages have been saved and enriched through these biblical truths. Over the years I have learned from these many women, and, responding to their cries for help, have added TWO NEW CHAPTERS and other small revisions to address their needs. One of the new chapters is called, Servant or Servitude? There is a difference. One is godly, the other devilish. Did we fail to make that distinction clear enough the first time around? Some have indicated such. So we tackled the subject head on. May God continue to bless you as you read and obey the wonderful words of God. You loved the book. Now enjoy the audio! Read by Rebekah Anast & Nathan Pearl, and available on Compact Disc or MP3. 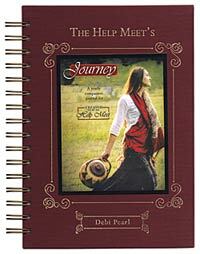 The Journey is a year-long companion journal for Created to Be His Help Meet, with 123 pages of studies and diary pages. There are special pages for your stories, doodlings, studies, and pictures where you will create a lasting memory of the miracle God is doing in you. Perfect for individuals or women’s study groups. The Created to Be His Help Meet book is now available in Spanish.